As many people did, I indulged a bit over the Christmas holiday week. I was saved from seemingly endless co-worker-made indulgences, subcontracter/vendor gifts, client gifts, etc., by the fact that I couldn’t eat anything anyone brought to me. (My husband could, and did. We passed the rest of it along to grateful relatives.) But I made up, at least somewhat, for what others couldn’t make me by making goodies for myself–allergen-free buckeyes (we were in Ohio for Christmas), raspberry-laced brownies, etc. In fact, as I mentioned in an earlier post, I had to remind myself that I did not need to keep pace in my Christmas consumption with the people around me. I came home 1.2 pounds heavier than when I left. It’s gone, as of today, but the gain was a reminder that eating sweets daily, eating full-plate portions of fattening foods, and not exercising (I was sick) will add up to weight gain that I don’t want or need. For most people everywhere, surely, food anchors holiday traditions. I probably spent some years denying the good in that, mostly subconsciously–devoutly refusing the Thanksgiving pie, accepting the stigma my culture has attached to celebrating food, especially for women my age. Because of the inscriptions written on our bodies . . . we are supposed to pretend if we are strong-willed that food is not all that important. Eat now and pay later, we’re warned. Stand on the scale, roll your eyes, and on New Year’s Day resolve to become a moral person again. But most of America’s excess pounds were not gained on national holidays. After a certain age, we can’t make a habit of pie, certainly, but it’s a soul-killing dogma that says we have to snub it even on Thanksgiving. Good people eat. So do bad people, skinny people, fat people, tall and short ones. Heaven help us, we will never master photosynthesis. Planning complex, beautiful meals and investing one’s heart and time in their preparation is the opposite of self-indulgence. Kitchen-based family gatherings are process-oriented, cooperative, and in the best of worlds, nourishing and soulful. . . . The key, for many of us who have struggled with our relationships with foods, is to get back on track with healthy eating after the holiday has ended. So, as many of us do at this time of year, I set about planning my upcoming week’s meals to be healthier, to continue the self-nourishment the holiday meals provide for some of us with, well, fewer calories involved. Healthy foods can be just as delicious, and definitely as nourishing, as high-calorie and high-fat ones. 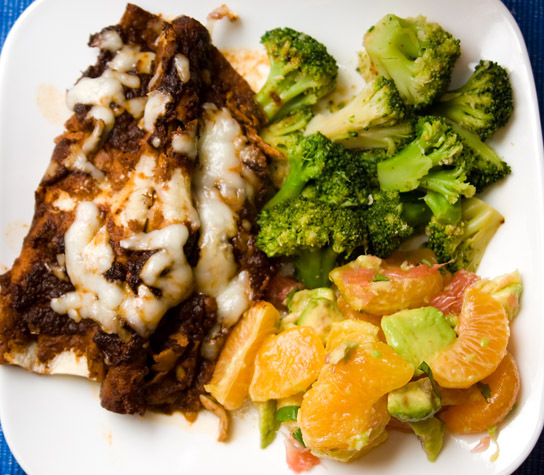 This plate contains (local, pastured, organic) chicken enchiladas in corn tortillas with a red sauce and goat cheddar; garlicky broccoli; and a fruit salad of fresh grapefruit, tangelo, orange, avocado, and cilantro. As you can see, a little over half the plate is strictly fruit and vegetable–with the avocado providing a wonderful contrast and a bit of healthy fat in the fruit salad. The enchiladas are not strictly vegetable-based, obviously; however, they do contain quite a bit of rich vegetable power in the thick, rich tomato/onion/dried pepper sauce. This plate isn’t 2/3 vegetable, but it’s getting there. And it’s definitely helping to reset my mind to enjoying and craving vegetable-centric meals. As a side note, that plate is actually too full–I only ate 2/3 of the food I put on it–but it’s also a salad plate. After reading the great book Mindless Eating, my husband and I only pull out our full-size plates when we are having more guests than we have salad plates; otherwise, we find ourselves eating less and being satisfied when we eat on salad plates. I do believe in intuitive eating, but I don’t believe we can simply intuit how to eat very easily in American culture. I also know for a fact that we have to deal with our emotional sources of eating (sources that might tell us to eat when we don’t actually want/need food), and I know that we have to work at setting ourselves up for success. Mindless Eating contains a good bit of solid, research-based information that will help keep any of us who are working on health and weight management on the right paths. Eating off salad plates was just one of the good ideas I culled from the book. Lunch: Cherrybrook waffles (good taste and texture, but not super-crispy) with cranberry-orange sauce (1 c. cranberries, juice and rind of an orange, some maple syrup, 1 T ghee, and 1 tsp. arrowroot powder cooked together on med. 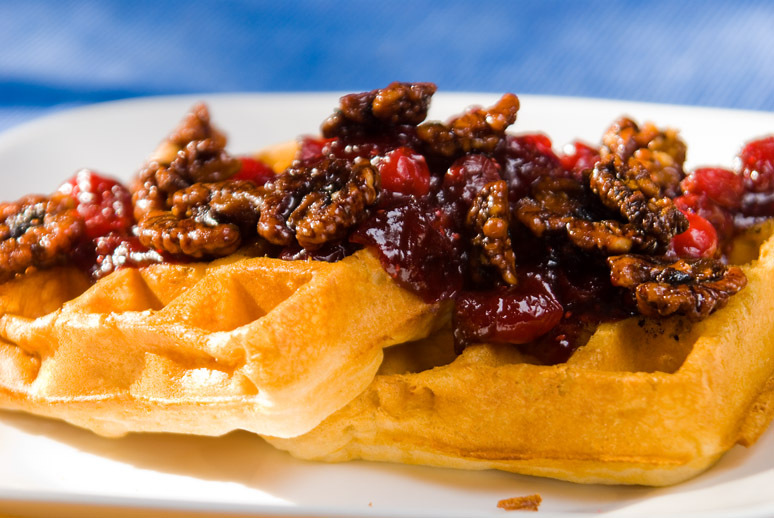 till most of the cranberries pop) and candied walnuts–it was easy and delicious! Dinner: Kale & black-eyed peas in a sundried tomato broth with cornbread (The recipe doesn’t call for black-eyed peas, but I’ll be adding fresh ones. Eating greens on New Year’s Day is a Southern tradition that is supposed to bring good fortune in the new year. As a bonus, beans & greens are a staple of many cultures for a high-protein, inexpensive meal. Also, they’re really tasty. I’m excited about trying this inventive recipe for them. I know we’ll be able to enjoy some healthy, fabulous, satisfying meals at restaurants in Seattle and Vancouver, as well. Please email me at sally dot parrott at gmail dot com if you have suggestions for where we should go in those cities for me to find good gluten-free, casein-free, egg-free, soy-free food. We eat on our salad plates too, but give ourselves permission to go back for seconds if we’re still hungry 10 minutes after we’ve finished the first plate. We’re usually not hungry at that point, and we almost never have the overfull feeling anymore. We tried it as a 30 day trial, but it was such a painless change we never even though about going back to full-size plates. Sounds like a great (and delicious!) plan. We also use salad plates and aim for 2/3 vegetables (though we definitely fall short sometimes). Thanks for sharing more delicious recipes that we can try! Dang, that looks good. I commented to my DH that almost everything we ate at Christmas was brown. I hate that. Bring on the greens! That is a tasty looking plate o’ food. Every time I read your blog, I wish you’d come cook for me. =) Hope you have a super 2008! I found square salad plates at Target in 2006, unfortunately they were discontinued before I bought more than the six I started with.